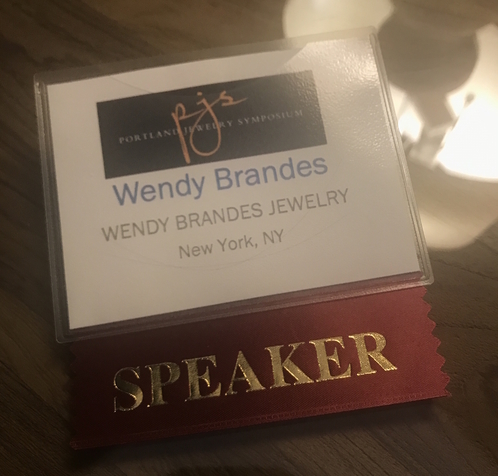 Thanks to jewelry-industry guru Peggy Jo Donahue, I’m out in Portland, Ore., to participate in a panel at the Portland Jewelry Symposium. This is my second Peggy Jo panel in a week. Last Tuesday, I was in New York talking about using social media as part of a design business at a 7:30 a.m. breakfast. 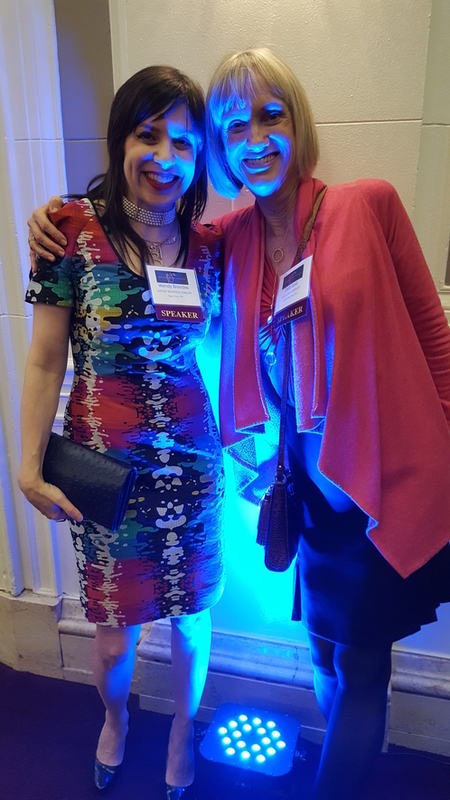 Can I just say that it was sublime to have these two sweethearts on a panel at the New York Jewelers Group meeting, which I had the honor to moderate? That is all. I’m happy that today’s panel is in the afternoon, so I won’t have to wake up before I normally go to bed! 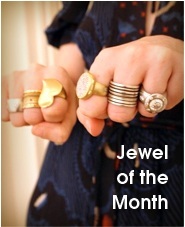 We’re discussing social media again, but this time in relation to selling custom jewelry. 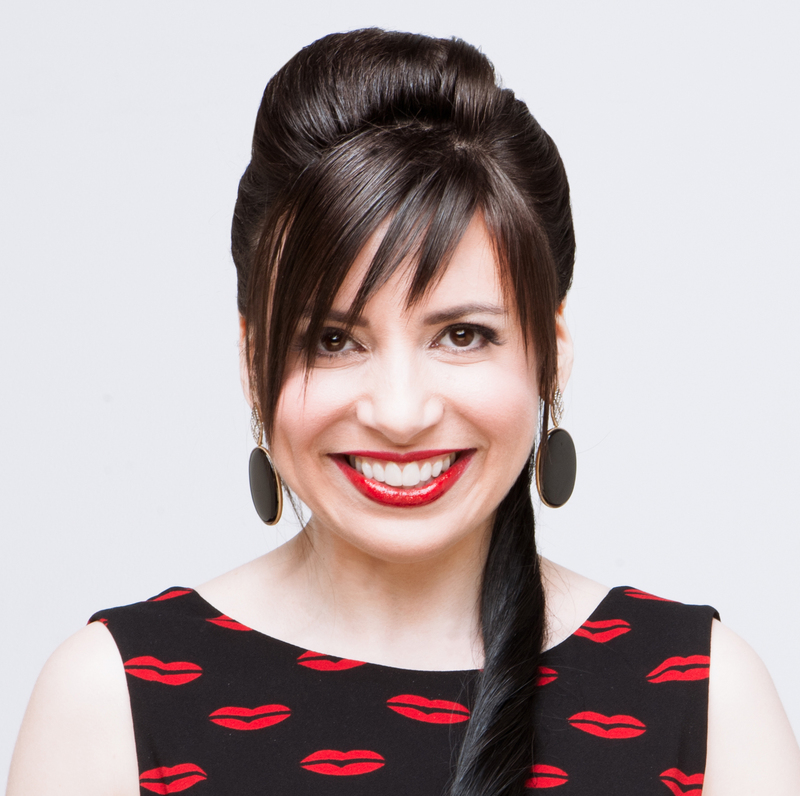 My fellow panelists are Lisa Krikawa of Krikawa Jewelry Designs and Calla Gold of Calla Gold Jewelry. I met Calla at dinner tonight, and we found a creepy blue light to stand in. We took a regular photo too, but we liked this one better. The Blue Man Group better watch out for us. We’re the new competition. My JC de Castelbajac dress was colorful even before I treated it to the blue-light special. I’ll have to take a properly lit, full-length photo of it another day, but at least you can see part of it here. 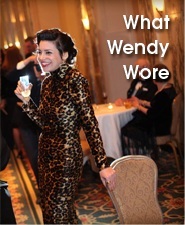 I got the dress earlier this year on Yoox.com. 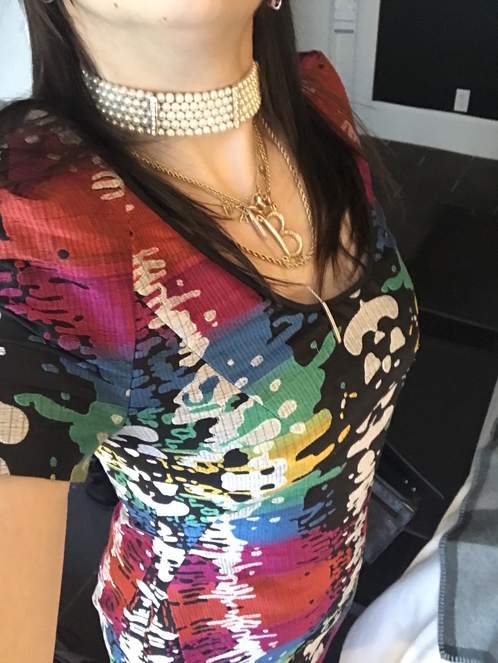 I’d been eyeing it for a long time, but wasn’t quite sure about a dress that looked like a rainbow had merged with a skeleton. But the Castelbajac stores I’d gone to in London and Paris have closed, and I figured this might be my last chance to snag something by this designer. So I did. No regrets!